Although I do consider myself quite the prog nerd, I often find myself largely ignorant about bands such as Platypus, Mullmuzzler or as is the case here, Karmakanic. I've certainly heard about them in connection to the "main bands" of some or all of their members but just never got to listening to full albums with thought. Going through In A Perfect World, Karmakanic's fourth album, I feel like I've been a damn fool for not diving in here because this is quite awesome stuff. Familiar to me before as the personal project of Jonas Reingold, bass player of Swedish hippie prog masters The Flower Kings, Karmakanic brings the expectably grandiose melodies and top notch musicianship while throwing curveballs our way as well. 1969 is a monster of an opener as a 14-minute tale about the Woodstock-generation. As such it indeed feels like the piece closest to those floral royalists with 70s Yes-style fourishes and mood swings aplenty. Turn It Up in turn somewhat changes the decade and brings a touch of the tricky AOR-mastery of 80s Yes in the form of slightly more straightforward arranging, undeniably infectious melodies and a killer chorus. This is still probably still my favourite off the record. The singing crew led by Göran Edman (familiar to me from Yngwie's Fire and Ice- & Eclipse-albums) and the band's second keyboardist Nils Erikson really shines bright. Their nifty vocal layering continues on The World Is Caving In which also brings the rock and grooves a bit harder in the vein of Deep Purple. Can't Take It With You makes the biggest swerve by going from a free jazzy piano intro to a full Tito Puente-style latin salsa groove that then melds into a more proggy off-beat rhythm. By the chorus the riffs and vocal melodies are most reminiscent of Porcupine Tree. And did I mention the near-yodeling mid-section and the occasional mock-death metalish grunts that are used sparingly for a really off-kilter effect? Somehow all this comes out of the blender really good although it's certainly a really long walking act on the tightrope. Add in the lightly jazzy and heavily prog rocking There's Nothing Wrong With The World (awesome solos, both guitar and keyboard and in unison are provided), the dark and brooding Bite The Grit and the bluesy Pink Floyd-vibes of the 10-minute album closer When Fear Came To Town and we've got some sweet dynamics going on. 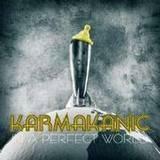 Overall, Karmakanic's prog chops on In A Perfect World come off as very organic and always keeping the focus on the craft of the song no matter the length of the tune. I feel that these guys have the mad skillz to provide crazy virtuoso performances in song-form if they wanted to but instead opt to keep things tuneful. There are flashy moments that fans of the Noodle should enjoy but above all this record is a brilliant exercise in how to make challenging prog that should also appeal to a broader base of listeners without dumbing anything down. Certainly makes me want to delve into older Karmakanic as well.